As you are aware we are fighting these developments on many levels. Firstly on a very local level we are fighting individual developers on individual development sites. Persimmon and Amber at BAN5 and Pandora at BAN2. Secondly we are making cases against the areas of BAN5 and BAN2 using the northern boundary for instance as one of our arguments. Thirdly we are fighting CDC on a district level against their proposed numbers, hoping to prove they are incorrect. All of these objections are relevant and as such all should be supported. Recently the press has reported that we are against the Miller Homes development, for the record we are not – as a group we don’t support it either. The Miller homes development may not be justified with the housing numbers we are suggesting which is at the top level of our campaign. So here’s where we have a bit of problem, Yes we oppose any of these developments because of the numbers. However I have recently been contacted by Sue Smith who writes to say the council will be sticking with their housing projections and that’s what has been sent to the Secretary of State. That does not mean we should give in about proving them wrong, it does mean that we WILL be fighting developments at BAN5 and BAN2 as CDC are adamant their numbers are correct. So we come down a level, to the boundary issue, again in the correspondence off Sue Smith she has confirmed that CDC have never guaranteed the boundary won’t be built upon or past, again this is not to say they are correct but this is what they have submitted to the Secretary of State. We have to come down yet another level fighting the developers at BAN5 and BAN2, this is where Miller Homes has the potential to help us. I won’t lie it’s a bit of gamble and one I can’t take on behalf of everyone. The strategy being that if we support the Miller homes build we can argue that we don’t need Persimmon or Amber houses. NOW the tricky decision, the risk being that if we support Miller homes and that gets the green light then we could actually get all of the developments including Persimmon and Amber. Therefore I will put TWO letters on the site for people to either agree with the development or oppose the development, that decision will be down to you. By Blocking all developments we could be considered NIMBY’s. I can assure you we are not. As I’ve always said we understand the need for more housing. We just don’t agree with the reason, the numbers, the locations or the demand. 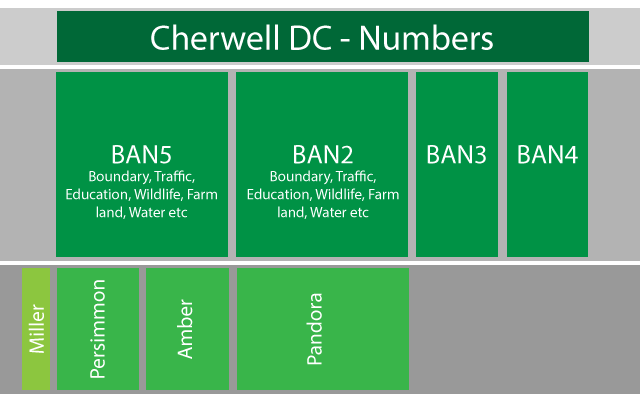 The whole local plan is a joke and the council show no interest in listening to the residents of Hanwell Fields, Banbury or the whole of Cherwell. This group was formed because housing to the North of Banbury does not make any sense. Please refer to why we oppose these plans to see all of our reasons. Looking at the council website their are a number of people that are not part of HFDAG from other areas near to the Miller Homes site who are objecting to these plans on the grounds of increased traffic on the Warwick Road. If I could be so bold and ask them why they think the development on Warwick Road, roughly 100 yards further North but on the opposite side of the road would not have an impact on the traffic to Warwick Road. Given that it is for more houses.So why are they not opposing that development ?